Sedef's Corner: How does what we see in museums affect our view of art history? How does what we see in museums affect our view of art history? There are certain defining moments when we feel we have figured out the answer to some profound truth that we had been searching for all our lives... maybe without even knowing we were. I had my "aha!" moment in a museum... before a 19th century portrait of a Turkish dignitary. Portrait of a Dignitary in Turkish Costume is attributed to George Dawe, an English painter who was renown for his portraits of Russian nobility and generals, but the museum label mentions a prior attribution to Thomas Lawrence with the sitter identified as Sidki (Sitki) Efendi, the Turkish ambassador to the British court in 1800. 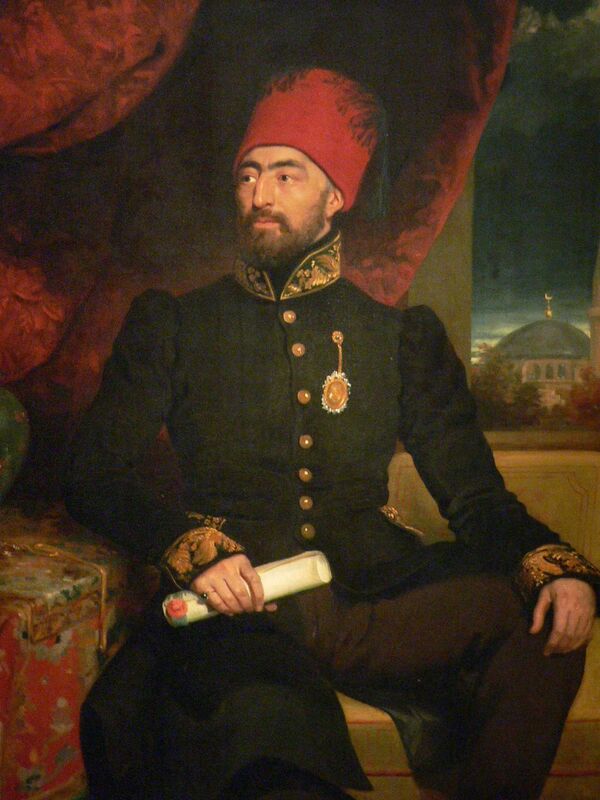 I like to think of my painting as the portrait of Sitki Efendi. I call it my painting because when I came across it in the gallery devoted to French, Dutch and Italian Paintings 1600 - 1900 at the San Diego Museum of Art, I felt as if I had run into a long lost friend... someone I recognized. And I hadn't realized how much it mattered to see a 'friendly' face on a museum wall until that moment. Sitki Efendi looked like a guy you might run into on the street, at a cafe, basically anywhere in Turkey... san the fez, of course. His face was an ordinary, recognizable Turkish face. There was no doubt in my mind. So, I sat there a while and contemplated the significance of seeing something familiar, from your own culture on the wall of a museum. I had always done this consciously and unconsciously noting the 'Turkish' features in works of art but this was different... this was a real person. I am an art historian of Turkish origin and every time I visited a museum, especially in Turkey, and encountered only miniatures, illuminations or calligraphy instead of portraits or paintings of real people I felt as if my past had been taken away from me. I kept on comparing what I had experienced to a Brit visiting the National Portrait Gallery and seeing the characters from their history in all their glory. Everyone knew what their Queens and Kings looked like, They had a concept of the general features of Englishmen and women and the landscapes they inhabited... as opposed to us who had to look at miniatures with abstract figures and landscapes that evaded exact representation. Of course there are a handful Ottoman Sultan Portraits as well as landscapes and portraits from late 19th early 20th century but these are far and few between. I had come a long way from the days of trying to read my own culture in Western terms by the time I encountered Sitki Efendi in San Diego but this did not lessen the novelty of the experience. As I sat and looked at the other portraits hanging nearby executed by Anton Raphael Mengs, Francisco Jose de Goya and Pompeo Girolamo Batoni, I wondered if this was how Spanish, French or Italians felt when they saw portraits of people from their own culture in American museums... which then led me to ask how much does a countenance on a painted canvas influence our museum experience? I emphasize countenance because even though the artist included a reference to the Hagia Sophia behind the sitter and there is a Turkish carpet covering the table he rests his elbow on, it is his face that I recognize as my own rather than these symbols utilized in Western art. The fact that this was a person as opposed to an object that was wholly Turkish captured my imagination. Reflecting on this experience as well as other countless encounters in museums where I have noted people from different nationalities examining pieces specifically from their cultures with more intent than others, I have often wondered how much thought or emphasis a museum puts to its target audience when designing an exhibit or acquiring works of art. There was an exhibit at the Metropolitan Museum of Art ironically called Interwoven Globe where a visitor would think that there was no textile industry to speak of in the Ottoman Empire and they had absolutely no influence on Europe except for ladies posing for portraits in Turkish costume. 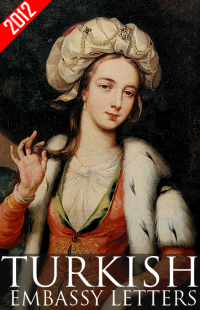 The influence of Ottomans on European textiles was covered by the inclusion of two paintings by Sir Joshua Reynolds and only a handful of textile remnants from the Ottoman empire. There were beautiful vestments made from Turkish silks with the explanation that these were made from kaftans given to ambassadors while serving at the Ottoman court but were donated to the church or sold at public auction when they got back to Europe because they "were hopelessly unfashionable at home. This raises the issue of how our home institutions affect how we view art or how our "worldview" of art history is formed? What kind of influence do the directors or the museum-going public exert on the collections of a museum? Tell me about it! I am always scouting out representations of Jews that are not anti-hebraic caricatures - and there are damned few of them before the Nineteenth Century. Turkey was indeed stunningly conspicuous by its absence in the Met show. What were they thinking...or not thinking? Here in Italy, everyone knows about the exchange of luxury items, especially textiles, with Turkey and the ongoing influence in both directions. There are Turkish textiles in churches and museums throughout Italy and I saw gorgeous Italian textiles in the Topkapi Museum - and there must be others elsewhere. If I remember correctly, a few years ago the Met did host an exhibition on Venice and the East that did include a lot of Turkish work, especially textiles. I was thinking about that as I previewed the show of largely pagan artifacts from the Saudi peninsula on Monday. The Saudi organizers of the show avoided any embarassing questions as to exactly WHY this rich trove of their pre-Islamic past is unknown to both the Saudis and the world at large. I got the enormous catalog as a perk as a reviewer and am amazed at the wealth of information in it - information that links the Saudi pre-Islamic world to the wider world. Turkey never suffered from having such rigidly closed borders but for the Western viewer, the language difference can be quite a barrier. @Ed Churhchill was right when he said "History is written by the victors" What we are seeing in Western art history is how the dominant culture of the Christian West perceived "the other" be it the Turk or the Jew. As long as an objective context is being provided this would be not be so bad - which they are trying to do these days. @Frank You are absolutely right, the "Venice and the Islamic World, 828-1797" show was mostly about the conflicts and exchanges Venice had with the Ottoman Empire. This is not so surprising since Venice was a trading Republic and Constantinople -going back to the time of the Byzantine Empire- was the richest and most important location for the Venetians. Basically, they could not have a Venice and Islam from 828- 1797 without including the Ottoman Empire which makes me wonder how they are going to manage the Seljuk exhibit planned for 2016 without loans from Turkey. @Nancy There was a Pan-Mediterranean culture from antiquity on that spanned a geography from the Middle East to the West, the physical remnants of which are still visible. Unfortunately, in trying to establish an Islamic identity these countries felt a need to deny the culture of the land. And in so doing letting the West claim sole ownership of these cultures. One other reason Turkey never suffered such a fate because they were always part of the West... even if it was as "the other" plus they were also physically present, in the lands they ruled in the West.